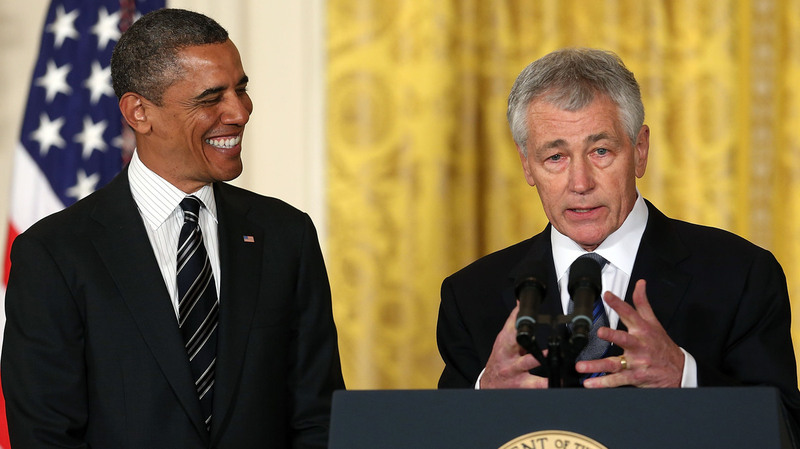 This Particular Nomination May Not Be About Obama; It's About Chuck Hagel : Political Junkie President Obama had a lot of great things to say about Chuck Hagel when he nominated him to become secretary of defense. But a lot of other folks — including Jewish groups, Senate Republicans and veterans of the Bush White House — are far more critical. Is it political? Or personal? Former U.S. Sen. Chuck Hagel, R-Neb., speaks at the White House on Monday after President Obama nominated him to replace U.S. Defense Secretary Leon Panetta. Democrats are fond of saying that Republicans are interested in only one thing, and that is to thwart President Obama at every opportunity. He proposes something, the GOP opposes it. He says it's day, they say it's night. In some cases, those complaints are justified; in others, it's just whining. But it's a complex story about the opposition to Obama's choice of Chuck Hagel, the former two-term Republican senator from Nebraska, to become the next secretary of defense. It may not be about Obama at all. Back home, during his 12 years in the Senate, Hagel was enormously popular. In 2002, he was re-elected with 83 percent of the vote, the largest landslide in Nebraska Senate history. But his relationship with Republicans in Washington is and has always been more complicated. Hagel, who left the Senate after 2008, would if confirmed become the first Vietnam veteran to head up the department. While Obama has pointed to Hagel's tour of duty in Southeast Asia — where he won two Purple Hearts — as positives, his opponents are focusing on a different part of the world. A sizable amount of the criticism is over the issue of Israel. Hagel has been famously quoted for having said in 2006, "The Jewish lobby intimidates a lot of people up here," and "I'm not an Israeli senator. I'm a United States senator." He also said, "I support Israel, but my first interest is I take an oath of office to the Constitution of the United States — not to a president, not to a party, not to Israel. If I go run for Senate in Israel, I'll do that." In addition, he broke with his party regarding the efficacy of sanctions against Iran and has said things about Hamas and Hezbollah that have troubled senators on both sides of the aisle, especially supporters of Israel. In light of the above, Jewish groups, such as the Anti-Defamation League and the American Jewish Committee, have been publicly expressing their concerns about the nomination, though neither has announced outright opposition. Other Hagel critics have gone further, saying that his comments make him anti-Semitic, or anti-Israel. Now, while railing against the "Jewish lobby" might not be the most politic way of making a point, questioning Israel's policies does not make one anti-Semitic. And while one might question the logic or reality of trying to engage with Iran, advocating such a policy does not necessarily make one anti-Israel. But the charge has been raised. Also, although he voted to authorize the war in Iraq, he became a leading GOP critic of President Bush's surge, at one point calling the administration's strategy "pitiful," comments that probably led to his falling out with John McCain, whom he had endorsed for president in 2000. (He also criticized Bush for describing Iran as part of the "axis of evil.") The neocons who backed Bush's conduct of the war are among Hagel's leading opponents today. Then there's his position on gays. During the 1998 confirmation hearings for James Hormel, President Clinton's choice for ambassador to Luxembourg, Hagel made clear he felt he wasn't qualified, calling him "openly, aggressively gay." Hagel waited until last month, as word spread about his possible nomination, before he apologized for those comments. Several gay and lesbian groups have accepted his apology, though not the Log Cabin Republicans, the gay GOP organization. "If Republicans had nervy firebrands like the late Sen. Ted Kennedy, someone would rise up to declare, 'Chuck Hagel's America is a land in which gays would be forced back in the closet and Jews would be accused of dual loyalty. Chuck Hagel's world is one in which devastating defense cuts become a goal, not a problem; we enter direct talks with the terrorist organization Hamas; and sanctions on Iran wither.'" But is the opposition solely about Hagel's views on the issues? Or is it about Hagel himself? He has never been especially popular with his fellow Republicans, and sure, they resented his independence, his contrariness, his willingness to stand up to his party. But it's one thing to be a "maverick"; it's another to play footsies with a presidential candidate of the opposite party, which is exactly what Hagel did in 2008, defending Obama from McCain's attacks (while his wife openly endorsed Obama). The way many Democrats feel about Joe Lieberman for going with McCain over Obama that year is comparable to how many in the GOP feel about Hagel. Hagel's willingness to take on the Republican establishment began much earlier; back in 1998, he unsuccessfully challenged Kentucky's Mitch McConnell, who was seeking re-election as chair of the National Republican Senatorial Committee. For the record, Hagel also endorsed Democratic Senate candidates Joe Sestak (2010 Pennsylvania) and Bob Kerrey (2012 Nebraska), but they lost to Republicans Pat Toomey and Deb Fischer, respectively. Hagel has never shied away from speaking his mind, and that fact alone has made him popular on the Sunday talk shows. His views on Israel, Iraq, Iran et al have put him, for the most part, out of the GOP mainstream. But the fact that much of his zingers over the years have been personal and aimed at his fellow Republicans has made this nomination battle not just about the politics. Richard Ben Cramer. If there's such a thing as a "must read" list of books about politics, then What It Takes, Richard Ben Cramer's account of the characters who sought the presidency in 1988, would be high on the list. The book is less about process and more about people and their psyches and what made them tick, something political writers often neglect to focus on. Cramer, who died last Monday (Jan. 7) at the age of 62, never reaped much money with this book, and truth be told it was initially dismissed as too wordy. But its focus — on Bob Dole, Gary Hart, Richard Gephardt, George H.W. Bush, Joe Biden and Michael Dukakis — was just masterful. "For years I watched all these Washington jerks, all these Capitol Hill, executive-branch, agency wiseguys and reporters go into, say, Trover bookstore, take a political book off the shelf, look up their names, glance at the page and put the book back," Mr. Cramer told The New York Times in 1992. "Washington reads by index, and I wanted those people to read the damn thing." Come to the LIVE Junkie show! The Political Junkie Road Show is coming to Washington, D.C., this Wednesday evening! The Road Show, which drew huge crowds in Orlando, Columbus and many other cities — to over four or five positive reviews — is basically a reprise of the Wednesday Talk of the Nation Political Junkie segment, but before a live audience and with tons of extra features! There will be newsmaker interviews, political trivia, ScuttleButton puzzles and, for the first time, FUNNY JOKES. In addition to shenanigans from Neal and me, there will be guest appearances by Nina Totenberg, Ted Koppel, Clarence Page, Ari Shapiro and Don Gonyea! It's being held at Washington's historic 6th & I Synagogue (600 I St. N.W.). This pre-Inauguration special program starts at 7 p.m. Wednesday, Jan. 16 (doors open at 6 p.m.). Tickets are $20. Click here for more details. Jan. 16 — Political Junkie/TOTN Road Show in Washington, D.C. 7 p.m. at the historic 6th & I Synagogue (600 I St. N.W.). IT'S NOT TOO LATE TO BUY TICKETS! Jan. 20/21 — Private/public inauguration of President Obama. Feb. 26 — Special election in Illinois' 2nd CD to replace Jesse Jackson Jr., who resigned. This day in political history: President-elect Jimmy Carter's Cabinet choices have been having an easy time getting confirmation approval by the respective Senate committees. Today Cyrus Vance, the nominee for secretary of state, won the unanimous recommendation of Foreign Relations; yesterday, Armed Services backed Harold Brown for defense secretary without any dissent. But Theodore Sorensen, the former JFK aide who is Carter's choice to head up the CIA, seems to be in trouble. Conservatives are wary of his lack of foreign intelligence experience, and liberals are alarmed at his past support of Kennedy policies in Cuba and Vietnam (Jan. 14, 1977). Sorensen will withdraw his nomination on Jan. 17. A previous version of this story incorrectly identified the American Jewish Committee as the American Jewish Council.